My latest foray into the Southern Tier Blackwater Series gives me Crème Brûlée. This Imperial Milk Stout is brewed with caramel malt, vanilla beans, and lactose sugar. These big, imperial beers from the Blackwater Series have been good for the most part, so let's see if this lives up to the reputation. Pours jet black with a one finger of off-white head that disappears quickly and doesn't retain. I could smell this as I poured it into my snifter. Tons of cream and burnt caramel. Vanilla is also huge. Any standard roasted malt presence is eradicated by the sheer sweetness of this beer. It really does smell like a crème brûlée. Holy crap is that sweet! A sweet cream flavor is at the forefront followed by caramel malts. Kind of a burnt brown sugar feel to it and the lactose sugar is disappointingly not working well with the other flavors. That's not to say it makes the beer repulsive, but it did make me take a step back every now and then between sips. Much like myself, it has a full, thick body. It feels just like an imperial milk stout should feel and that is thick and sweet. It has a surprisingly bitter finish, but the palate isn't destroyed by the sweetness of it all. 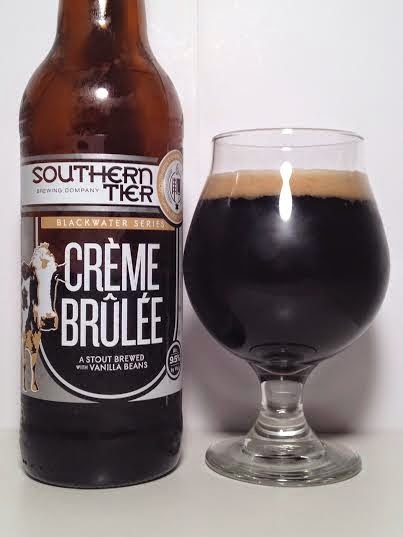 Southern Tier Crème Brûlée is a full-bodied, lactose-driven, burnt-caramel roller coaster ride full of hyphenated adjectives. Without question it dances on the line between sweet and too sweet, so if you fancy the sweeter beers, this one is for you. For the more casual drinker, this could be a bit overwhelming. I did find the lactose to be a bit of a turn-off, especially if the beer warms up even just a little bit. As you sip this one (and trust me, it's a sipper), the cream/lactose flavor becomes hard to swallow (literally and figuratively). The flavor clings to your tongue in an unpleasant way and the smell won't leave my moustache. I could probably down a 12oz glass no problem, but a bomber is too much for me to handle. Not bad in small doses, but I wouldn't tackle a lot of it at once.